Hey guys! 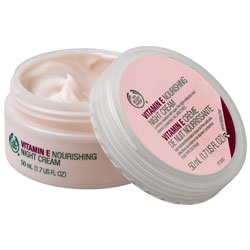 So I have given the vitamin e night cream a go, as I’m already using the moisture one, which I call the morning one. I must say my skin feels so much better already! This is also from the Body Shop and is £12. Worth the price! This isn’t greasy on your skin and makes your skin super soft! It also leaves my skin really hydrated. Again a little bit goes a long way. To be honest this does everything it says on the tin, which I find is hard to find, as you see things advertised all the time and most of them don’t do half of what they’re meant to do! I love this product. Does anyone else use this product?